Midwestern Gothic – A Literary Journal » Blog Archive » Issue 15 is here! 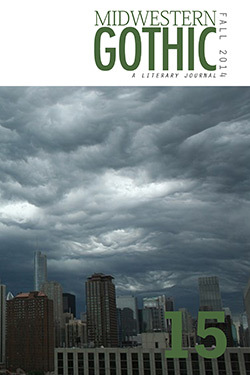 Midwestern Gothic Issue 15 (Fall 2014) is here! Grab something pumpkin flavored, don your favorite sweater, and spend a fall afternoon with the best literary voices the Midwest has to offer. Featuring fiction from Jen Bingham, Michael Czyzniejewski, Justin Fetterman, Joey Dean Hale, Dustin M. Hoffman, Joseph Holt, Laura Hulthen Thomas, Scott Koertner, Leyna Krow, Danielle LaVaque-Manty, Stephanie Liden, Wendy Oleson, Alex Pickett, Sarah Elizabeth Schantz, Richard Spilman, Stephen Truman Sugg, Brendan Williams-Childs. Poetry from Nancy Austin, Jim Davis, Claire Eder, Yahya Frederickson, Kelly Granito, Lisa Higgs, Aaron McCoullough, Mary McMyne, Ken Meisel, Jillian Merrifield, Corey Don Mingura, Marisa Moks-Unger, Robert Perchan, Richard King Perkins II, Emily Jo Scalzo, Jenna Stoeber. Midwestern Gothic is a quarterly print literary journal out of Ann Arbor, Michigan, dedicated to featuring work about or inspired by the Midwest, by writers who live or have lived here. Midwestern Gothic aims to collect the very best in writing inspired by the Midwest. Subscriptions to Midwestern Gothic and MG Press are temporarily unavailable.